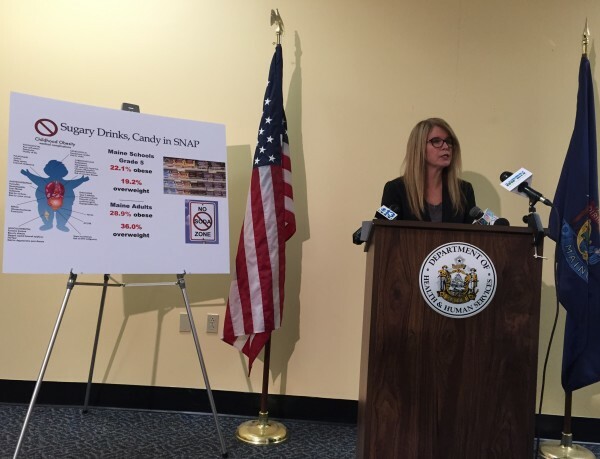 Mary Mayhew, commissioner of the Maine Department of Health and Human Services, explains during a news conference Monday why the department is seeking a federal waiver to allow the state to prohibit the use of Supplemental Nutrition Assistance Program benefits for the purchase of soda or candy. AUGUSTA, Maine — Gov. Paul LePage’s administration said Monday that it has asked the federal government to allow it to ban the purchase of soda and candy with food stamps. It’s a longstanding goal of the Republican governor that is virtually assured to fail: States can’t regulate purchases under the federal and state Supplemental Nutrition Assistance Program, so Maine has to ask the administration of President Barack Obama, a Democrat, for a waiver that no state has received. “We’ve got to create the pressure from the states on the federal government, on Congress, to enact these common-sense reforms,” she said. Similar proposals have gotten some traction behind a coalition of conservative welfare hawks and health advocates. At least nine states — including California, Texas, Florida and Vermont — have tried similar efforts to allow health-based changes to food stamp rules, according to a 2012 report from Eat Drink Politics, a food industry watchdog group. However, the Maine Legislature rejected bills from the administration that would have directed the administration to pursue waivers allowing the state to ban “junk food” purchases with food stamps in 2013 and 2015. Mayhew said the department always had the authority to seek a waiver alone, but the administration wanted to gain legislative support. A Monday letter from Mayhew to the U.S. Department of Agriculture was Maine’s first formal request for a change. It’s narrower than the past proposals, targeting only soda and candy. Advocates have criticized Mayhew’s department for its cuts to Maine’s food stamp program. Enrollment in the program dropped below 200,000 in September, nearly 57,000 down from its high in February 2012. In July, DHHS announced that it would make able-bodied adults meet federal work requirements to keep SNAP benefits and in September, the department introduced a rule change bringing back an asset test for benefits. The department said 15 percent of Mainers receive food stamps, with 88 percent of them getting Medicaid, the federal-state health care program for low-income people. Maine spent $1.5 million on obesity-related Medicaid claims from October 2014 to October 2015, according to DHHS. Dr. Jonathan Shenkin, an Augusta pediatric dentist and a former president of the Maine Dental Association who has long proposed SNAP reform, said at the news conference that he supports the change to combat a “daily onslaught of tooth decay” he sees among children based on their sugar consumption. “We’ve seen a lot of proposals from this administration that are punitive in nature,” she said.